Chris Lee :: Lane Enterprises, Inc.
Chris Lee is a newly transplanted General Manager from Wendy’s. When the local owner/operator sold his 38 stores, Chris decided it was time to make a change as well. 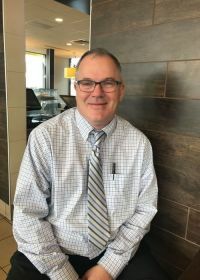 Chris worked at McDonald’s in North Carolina for a while, and joined Lane Enterprises in 2017. He started at South Rock where he stayed for almost six months before transferring to Harry and Hillside about five weeks ago. Chris said for him it’s more the business side of McDonald’s that he is getting used to. When it comes to the employees however, it’s less about business and more about getting to know them. General Managers like Chris often find their motivation through their Supervisors. Des Penix is Chris’ Supervisors and he says she is always there for her.